If the reading is correct, the name of a city mentioned only once in the Bible (II Sam. xxiv. 6). It was one of the places included in the route of Joab and his associates when they were sent out by David to number the people. Their route was eastward across the Jordan, northward through the trans-Jordanic tribes, westward to Sidon, passing Dan-jaan on the way, and southward as far as Beersheba. 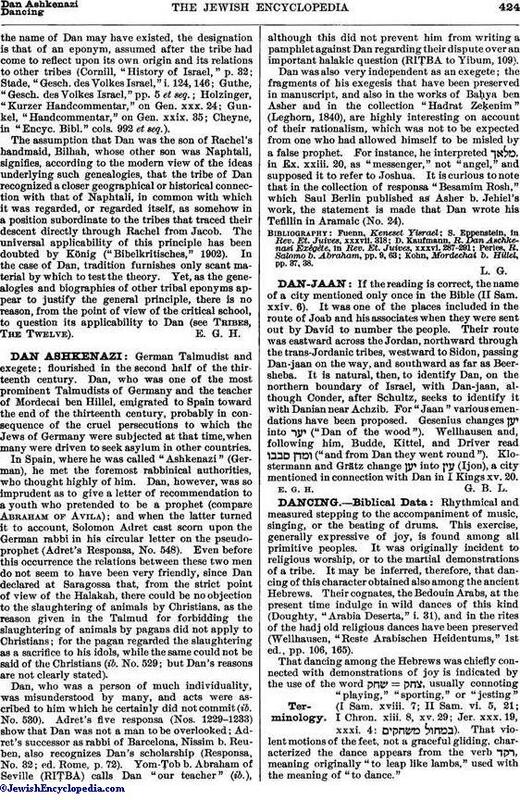 It is natural, then, to identify Dan, on the northern boundary of Israel, with Dan-jaan, although Conder, after Schultz, seeks to identify it with Danian near Achzib. For "Jaan" various emendations have been proposed. Gesenius changes into ("Dan of the wood"). Wellhausen and, following him, Budde, Kittel, and Driver read ("and from Dan they went round"). Klostermann and Grätz change into (Ijon), a city mentioned in connection with Dan in I Kings xv. 20.